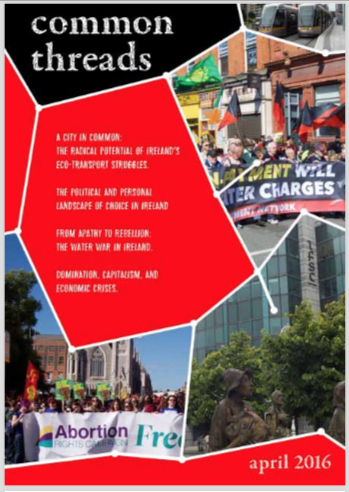 This 44 page magazine was published by the Workers Solidarity Movement in 2016, as a successor to the Irish Anarchist Review. Only one issue ever appeared. Other articles deal with the then growing mass boycott of domestic water charges (shortly after it was written the government admitted defeat and ‘suspended’ the charges); arguments against immigration controls and an interview with Bairbre Flood of Cork Refugee Solidarity about her experiences and impressions working with migrants in Europe; a critical piece about the Yes Equality campaign which won the referendum giving equal marriage rights to gays and lesbians; why the 2008 financial crash happened, the dominance of speculation and the creation of a lucrative bad debt industry; interviews with people from a couple of workers’ co-operatives in Belfast, a guide to efficient organisation of meetings; and a five-page What Is Anarchism? The cover story is about the Health Board boss, Ernest Kirkpatrick, who also ran a company which used blood pressure gauges stolen from Craigavon hospital and then sold the finished products back to the NHS. Kirkpatrick also conned the health service into buying him a luxury house. Sharing the front page is an article by the Moyard Housing Action Committee about the sewage problem on their estate which led to an outbreak of polio. 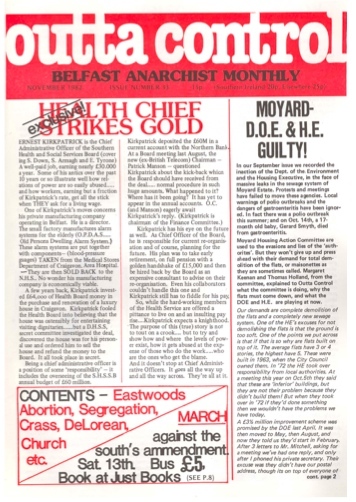 Inside there is an interview with two shop stewards about the strike for union recognition at Eastwoods scrapyard (a major employer in West Belfast and owned by the same ‘Mr Eastwood’ who was boxer Barry McGuigan’s manager). Their Dublin correspondent reports from the campaign against the amendment which put the ban on abortion into the Constitution. How the anti-choice brigade got the Black Sheep pub in Coolock to cancel a room booking for an anti-amendment public meeting, and then tried to break up an outdoor meeting organised as an alternative. This 24 page issue marked the reappearance of Workers Solidarity after an absence of almost a year. It had changed from a monthly 8-page paper to a quarterly 24-page magazine. The new format saw a move away from labour exchange and Friday night pub sales to a greater concentration on events attended by people who already had some sympathy for radical ideas. 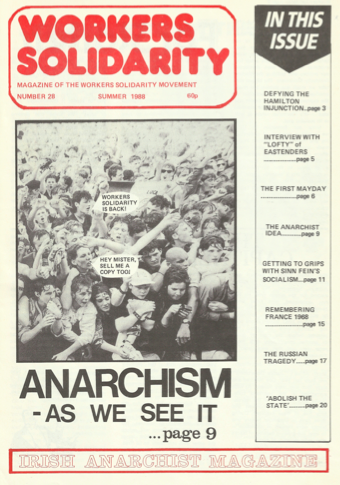 The print run was reduced to 500 and the new format saw a move away from labour exchange and Friday night pub sales to a greater concentration on events attended by people who already had some sympathy for radical ideas. – A history of May Day, and it’s origins in the 1886 execution of anarchist trade unionists in Chicago for their part in the struggle for the 8-hour day. 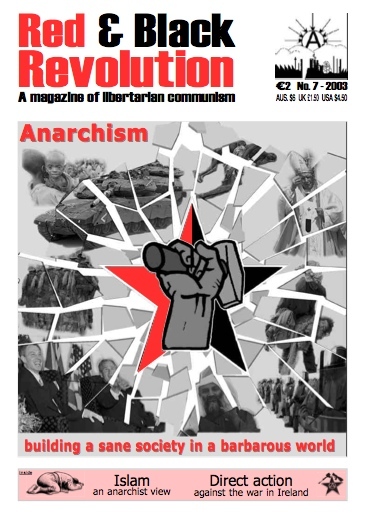 This local newsletter was published by the Cork branch of the Workers Solidarity Movement, who announced that “Rebel Worker will be appearing bimonthly (when possible) and will be distributed both on its own and as an insert in the WSM’s long-standing free newspaper, Workers Solidarity”. However this plan was abandoned and only this one issue was produced. 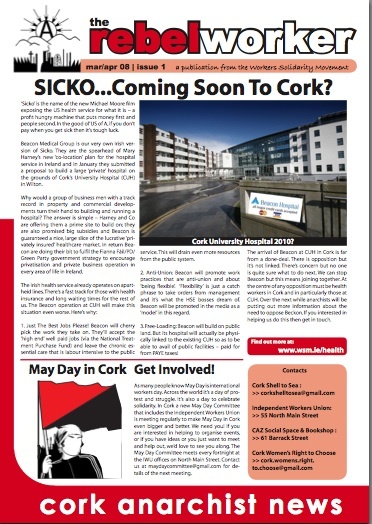 Articles covered ‘co-location’ private hospital plans in Cork city, a short piece on preparations for the 2008 May Day parade in the city, and an interview with an abortion rights activist from the Cork Women’s Right to Choose Group. As class struggle anarchists who recognise the importance of a diversity of tactics in order to attack Capital, the State, and oppression in an effective manner, we see the black bloc as an important tool of struggle. Only one tool among many, but an important one nonetheless. It is certainly hard to avoid the conclusion that anti-globalisation protests that avoid direct action will kill off the movement, or at least greatly reduce participation in it. The Republic of Ireland has one of the most draconian abortion laws in the world. At present abortion may only be performed where continuation of pregnancy poses a ‘real and substantial’ risk to a pregnant woman’s life – about 5 cases per year of 50,000 pregnancies. In every country after February 15th the anti-war movement was thus faced with the question of what to do next. In Ireland almost all of the direct action protests were targeted on Shannon airport. More than half dozen successful actions took place, ranging from a large scale breach of the fence in October, to physical attacks on planes as the build up to war escalated. After months of regularly attending the Irish Anti-War Movement’s marches and particularly after months of listening to the speeches of the leading lights of the IAWM my head is buzzing with cant and rhetoric and I have that dejected feeling you get when you know you have just lost a chance that won’t be coming around again for a long time. Within hours of the start of the Spanish revolution workers had seized control of 3000 enterprises. This included all public transportation services, shipping, electric and power companies, gas and water works, engineering and automobile assembly plants, mines, cement works, textile mills and paper factories, electrical and chemical concerns, glass bottle factories and perfumeries, food processing plants and breweries. Anarchists also seek to create communism. But for us freedom plays a central role, not only in the future society, but in how we try to get there. That is why, when we talk of communism, we talk of libertarian communism. Most mainstream groups eventually come down clearly in favour of immigration controls and deportations, though arguing for “generosity.” This book takes a position that so far has only won over a small but growing minority and argues for the immediate ending of all border controls. The September 11 attacks, the Afghan war that followed from it and the ongoing war in Israel/Palestine have once again raised the issue of Islam in the minds of many anarchists in Ireland and Britain. Not just because of the role Islam has in shaping those conflicts but also because militant Islam has become a far more noticeable presence on solidarity demonstrations.